The holiday season is upon us and I’ve been dreaming of sharing an easy snack cake to have around if you happen to be hosting family or friends this time of year. You know, the kind of cake that is justifiable as a “snack” or “breakfast” because it has fruit and vegetables in it. Yes! That kind. Let’s bake, shall we? 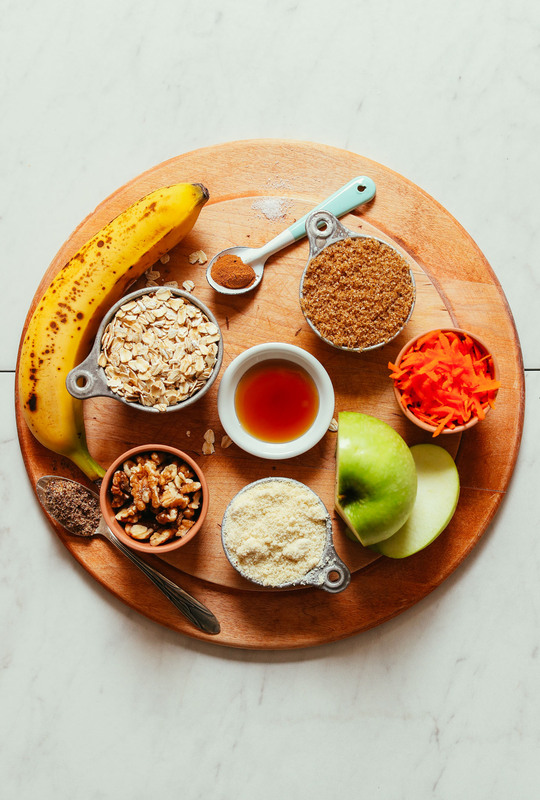 This 1-bowl recipe starts with a flax egg for binding and mashed ripe banana for some natural sweetness and moisture. Then come tasty ingredients like brown sugar, grated carrots and apples, and cinnamon. For dry ingredients, we went for a blend of almond meal or flour, oats, and our gluten-free flour blend, which kept the cake fluffy, tender, yet perfectly moist. Chopped walnuts add a bit of crunch and nutty flavor. After a quick bake in the oven (and the painstaking minutes of letting it cool), it’s time for cake! While delicious on its own, it’s elevated with a simple cashew lemon maple frosting (recipe below)! Swoon. This would make the perfect cake to have on hand for gatherings or lazy days spent with loved ones this holiday season. It would also be delicious come spring! Basically, it’s perfect year round for just about any occasion. If you’re into cake, also be sure to check out our Vegan Gluten-Free Carrot Cake, 1-Bowl Vegan Gluten-Free Vanilla Cake, 1-Bowl Pumpkin Cake, and Gluten-Free Vegan Chocolate Hazelnut Cake! 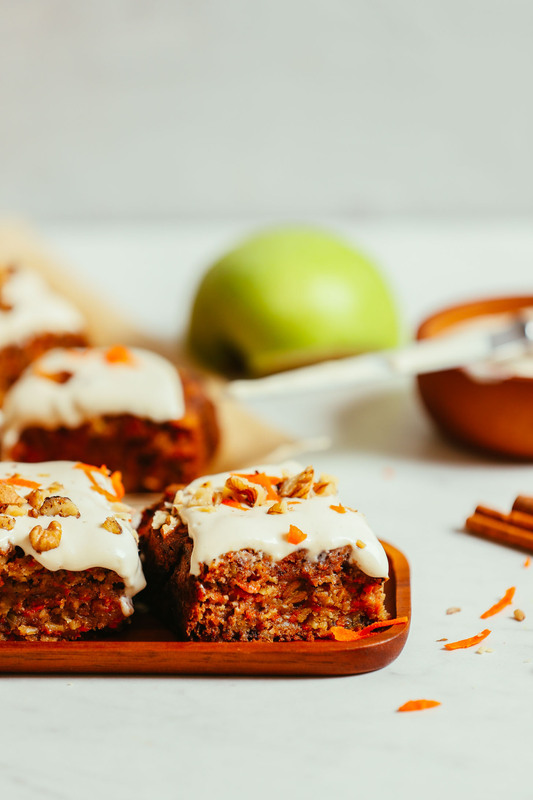 Hearty, vegan carrot apple snack cake made in 1 bowl! Wholesome, simple ingredients, simple to make, tender, and perfectly sweet! Prepare flax eggs in a large mixing bowl (by mixing water and flax seed and letting it rest for 5 minutes). Also preheat oven to 375 degrees F (190 C) and line an 8 x 8 inch baking dish or similar size pan. To flax eggs, add olive oil, mashed banana, and maple syrup and whisk to combine. Next add brown sugar, salt, and cinnamon and whisk to combine. Add almond milk and stir. Then add grated carrot and apple and stir. Add oats, baking soda, almond meal (or flour), and gluten-free flour blend and stir to combine (see photo). You should have a thick but pourable batter - add more almond milk to thin if needed or more gluten-free flour or almond meal to thicken. Pour into prepared baking dish and top with crushed walnuts. Bake for 40-45 minutes on a center rack or until deep golden brown and a toothpick inserted into the center comes out clean. When you press on the top, it shouldn’t feel too spongey, so don’t be afraid of over-baking! The GF blend just takes longer to bake than glutenous cakes. Remove from oven and let rest in the pan for 15 minutes. Then gently lift out of the pan and let cool completely on a wire baking rack or flat surface. The longer it cools, the more airy and light the cake becomes. OPTIONAL: While this is happening, you can make your frosting by adding soaked, drained cashews, coconut oil, coconut milk, lemon, maple syrup, and vanilla extract to a high-speed blender and blending on high until creamy and smooth. Taste and adjust sweetness or tartness as needed by adding more maple syrup or lemon juice, respectively. Then refrigerate to firm. Wait to frost the cake until frosting has thickened (about 2 hours), and the cake has cooled completely. Store completely cooled leftovers loosely covered at room temperature up to 3 days, 5 days in the refrigerator (if frosted, it does need to be refrigerated), or in the freezer up to 1 month. Best when fresh. 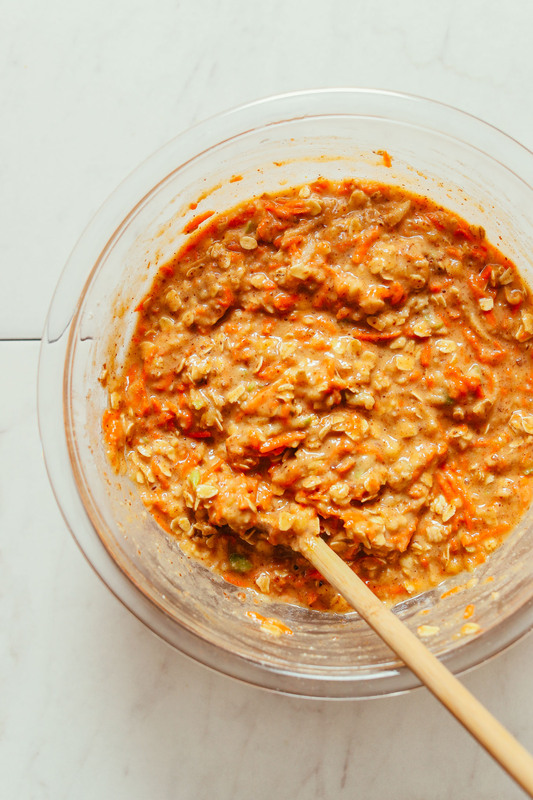 *Recipe heavily adapted from my Carrot Apple Muffins! This turned out delicious and also tastes healthy! I added some cardamom to the mix. Please keep posting these clean, delicious vegan recipes. I love your cake recipes! Hello! I am a college student living abroad, and I do not own an 8×8 pan. Does anyone have a suggestion as to how to adapt this recipe to bake in either a loaf pan, 13×9 pan, or into muffin molds? Thanks! Hi Paris, we would recommend using a muffin tin and baking at 375 for 32-36 minutes as we do in this recipe. Hope that helps! I made this and it was to die for. The frosting was nice but honestly the cake stands on its own, too. Also I left half of each recipe (carrot cake and frosting) unbaked and froze them, I’m going to defrost and bake/frost at the end of the month for a friend’s party. I will let you know how that turns out. So glad you enjoyed it, Nora! Thanks for the lovely review! We are excited to hear how it turns out for your friend’s party! FYI I froze the batter in a loaf pan for about a month, took it out a day beforehand and baked it, it was just as delicious! The frosting also froze well and there was no discernible difference from the unfrozen quality. Cake and frosting turned out great. I subbed applesauce for oil, used coconut sugar and Lankanto sugar free syrup, and used spelt flour and almond flour. The cake was only slightly sweet, but I am accustomed to that. I have had a few flops with subbing sugar with sugar free, and subbing for white flour in recipes so was very happy this worked. Your recipe and directions were right on. Thanks! This is more than 10 ingredients, eg not minimalist. I’m on this website because ingredients overwhelm me and I turn to the easy solution. Please honor your about /motto section. Hi Phoebe, our recipes fall under one or more of the following criteria, but not necessarily all: 10 ingredients or less, 1 bowl, or 30 minutes or less. If you are looking only for our recipes with 10 ingredients or less, you can find them here. Hope that helps! I’m thinking of making this cake for my daughter’s bunny-themed first birthday. Do you think it would work to double the recipe and make two rounds to stack or should I stick to your other carrot cake recipe? Is the frosting too drippy for a tier cake? This one looks so delicious, but it seems like it might be a bit heavy to stack. Thoughts? Hi Dana, we think the other carrot cake would work better for a stack as you are correct that this one is a little more dense. Hope that helps! After initially seeing this snack cake a few months ago, I’ve made it many times for my household and friends. It is quite a few ingredients, but I have them almost memorized at this point. As I have one in the oven now, I thought it was time to comment. “I just love it.” It’s quick, one bowl, healthy and delicious. Something I haven’t seen anywhere else. Can we make them into cupcake style? Would that be possible, just less time in oven? Hi Jay, we haven’t tried that, but think it will work! If you give it a try, we would love to hear how to turns out for you. Love this recipe! Only problem is I’ve noticed the frosting turning a pinkish color in certain spots. Any idea what that could be from? Maybe the walnuts? Hi, I was wondering what I could use as a substitute for the gluten free oats. I did some research and discovered that gluten free oats contain the protein avenin, it is an essential part of oats (as gliadin is with wheat). Oats will never be gluten (ie avenin) free [even if they are described as gluten (i.e. gliadin) free]. 1:5 (20%) of people with Coeliac disease react to pure uncontaminated oats i.e. they react to oat avenin. This discovery worried me, what would you suggest? Hi Sarah! Another reader uses quinoa flakes in place of the oats. That may work? 1) I didn’t have an 8×8 pan, so I used a deep pie pan. The cake was starting to burn around the edges and it passed the toothpick test after about 25 minutes, so I took it out and let it sit until cool. The center of the cake hadn’t actually cooked, so it was very gooey in the middle, but most of the cake was a great texture, perfectly moist. I’m going to try a lower temperature next time. 2) I couldn’t get the cashew icing to the creamy/glaze texture pictured. I soaked the cashews for 30 minutes in super hot water, but I think I might try soaking them longer next time. Also, I subbed whole wheat flower for almond meal and it was fantastic. I also added more like 2/3 c. banana with great results. 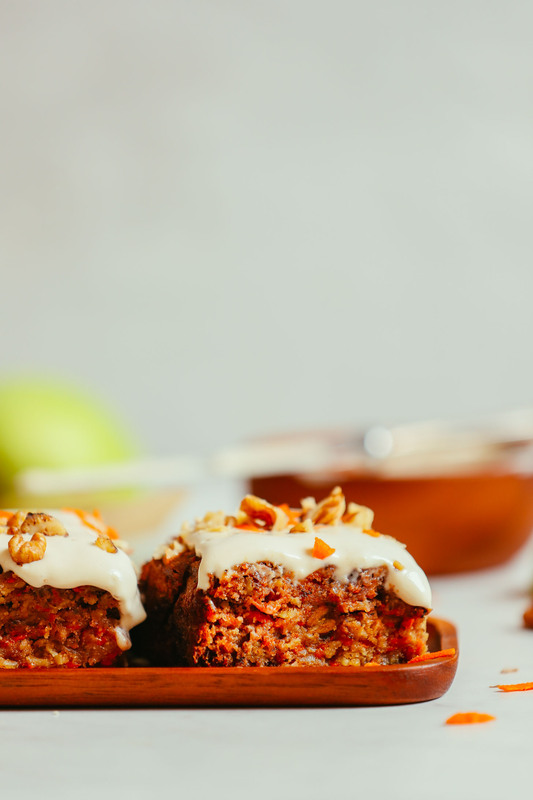 I make your Carrot Apple muffins all the time and love them! They are a bit sweet for a healthy snack for us though, so could i leave out the sugar all together or will that affect the texture too much? I think the fruit & maple make it plenty sweet but don’t want a gummy or un-cake-like texture. Thanks! I used ripe pears instead of the banana and completely eliminated the brown sugar. I did add 1c in stead of 2/3c oatmeal to compensate for the reduced dry ingredients and it turned out great! First time baking with an egg replacement. I decided to try this recipe with a chia seed egg. I also used rice flour instead of GF flour and the almond meal, and dark brown sugar. I have a convection oven and it tends to bake more quickly so I pulled it out after 30 min. I think the rice flour made it too sweet and I wasn’t crazy about the texture, not sure if this was from the chia egg? I do love the that its packed with fruit and veg, if I made it again I would try with a different flour combination. So excited to try this! Wondering if quick oats might work instead of rolled? Thank you! Yes, quick oats should work fine! This was so easy to do. I am doing it every other week. First I made it per instructions. Received a big thumbs up from hubby. I made it with carrots and coconut because I didn’t have enough apple, still awesome. A recipe you can’t go wrong with. Well, I am a experienced cook….it took me about 30 minutes prep time. I did not make the icing, these are to be used as breakfast muffins. I used 1/2c tahini instead of the 1/4c oil called for. 1/3c each of coconut flour, brown rice flour, AP, Einkorn. Cashew milk was used as the non-dairy milk but I had to use about 1-1/4c to get the mix to a proper consistency. Used apple pie spice in place of cinnamon – 1 tsp. Omitted banana. Used coconut sugar and syrup. Used Cosmic, yellow and lunar carrots. Fuji apple. As muffins, cooked 30 minutes@350 in my Breville oven. Came out very moist. I think next time I would add canned organic pineapple and instead of all cashew milk, 1/2 cashew and 1/2 pineapple juice. They were a little bland, good, but looking for more punch in the taste so I think the pineapple might add that. I did add 1/4c each diced pecans, walnuts and pepitas. Thank you for the recipe, it is a keeper. Delicious! Trying to cut back on oil so substituted with unsweetened applesauce, so moist and not too sweet, my boyfriend and I fought over the last piece! This is one of the best things I think Ive ever made! Thank you! I seriously love this recipe and feel so good about eating the ingredients. I use coconut sugar and didn’t find it too dense, and I like it without the frosting. The 2nd time I made it, I subbed grated zucchini for apple, and this worked quite nicely. Thank you so much for your beautiful recipes. I love everything I try from your site! I’m looking at making this for my family but my sister is allergic to cashews. What else could I use in place of this for the icing? Excellent recipe! Thank you for another great recipe. The entire family enjoyed this dish. Would the recipe turn out if I substituted real eggs for the flax eggs? And pumpkin puree for the mashed banana? Also, just got your Everyday Cookbook for Christmas and can’t wait to dig in! Yay! We hope you LOVE the cookbook, Sam! It’s yummy. I made it without the frosting for my kids for breakfast. I substituted honey for brown sugar and added a couple tablespoons of shredded coconut and dried cranberries. I also used pear puree in place of oil. I ground the oats to a course texture and used in place of gf flour a 1/3 cup whole wheat, 1/3 cup brown rice, 1/3 cup all purpose, &1/4 cup coconut flour. Great! Thanks for sharing, Carol! thanks for sharing. i was scrolling through looking for ways to take out the sugar so my kids could also have for breakfast! This is such an amazing recipe! I followed the instructions to a tee and the texture, taste and flavour were perfect to my liking. It was my first time to try a frosting that’s dairy-free and oh wow it’s so yummy. I highly recommend making the frosting which was so easy to whip up anyway. Well done Dana! Thank you for all your great recipes. This is maybe the best recipe you’ve ever done and thats saying something since I love all your stuff! The frosting is so perfect! We’re so glad you enjoyed it, Jennifer! Hi, I am on a low-fiber diet. Anyway to cut back the 3.6 grams of fiber/slice in this recipe?? I’d say the oats are probably the main source of fiber. So try subbing that out for almond flour or more GF blend! I just made this and the only substitute I used was raw cane sugar for the brown sugar. I thought the cake was delicious! The frosting was OK and tasted good with the cake. I haven’t found a vegan frosting that I love, but this is the best I’ve had so far! Very yummy so thanks for sharing :)!!! Wow this turned out great!!! It’s so lovely and moist, not too sweet and I want to eat it all day long!!! And it’s gluten free!!! Thank you Dana for sharing your wonderfully healthy recipes…..
Made this today, only sub was all-purpose since I didn’t have gluten-free flour (and don’t have a gluten problem anyway). WONDERFUL! Very dense and moist, delicious, easy! Great with the cashew frosting. Definitely a keeper! Even though I have only heard of snack cakes recently, I wish I enjoyed them more throughout my life! My mother did allow us to treat ourselves with a slice of coffee cake in the afternoon or early in the morning as a mid-day snack, but I always found a way to sneak into the kitchen and slice myself a few extra pieces! I guess that’s the main problem with cakes and I–what should be a snack or a dessert turns into a meal because the slices that are indicated as a serving size are just so small! But anyways, I’m sure that anything with more richness, aroma, and comfort will allow myself to moderate my portions, LOL! 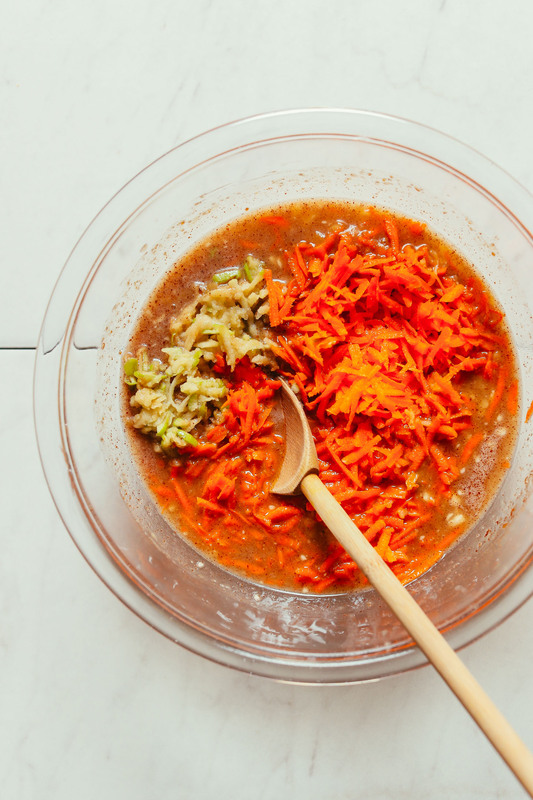 Since your recipe includes carrots and apples, I can be sure that I’m incorporating more fruits and vegetables into my diet and feel more satiated from the extra fiber! Mine turned out very strange… used coconut sugar, and like the recipe warned, it was very dense. Was so perplexed by how doughy it was… had to bake it for like an hour and a half because it was inedible. Turned out very dense and doughy (maybe I put too much fruit?). My rec- do not use coconut sugar, as that was the only thing I did differently. Flavors were perfect though! Followed the recipe and it’s very tasty. It’s a bit more denser than I usually like my carrot cake. The frosting is very good. First time I’ve made that as well. This was more like a bread than a cake. Sadly it was dry and heavy and in my opinion, not nearly carrotty enough! The cashew cream cheese icing was good tho! Dana, this is deliciou!! Thanks for all the effort you put into your blog. I appreciate you. Wow! We are new to vegan cooking/ baking and made this for a party the other night. It was SUPER easy and delicious. The “frosting” I made is off a bit. Even people who eat vegan regularly loved it but thought the frosting was off. I will try again as I am brand new. But the cake is super moist and just all around yummy. Stuck the leftovers in the fridge and had for breakfast the next day! Wow!! I made this last night and it was delicious. I love the added apple which makes it extra moist. And I love the one bowl. I followed the directions exactly as is with flax meal egg and all. I probably could have cooked it to 45 mins instead of 40 mins but my boyfriend says its delicious the way it is. I make a lot of almond milk so I have lots of almond meal to use so loved having that in the recipe. I even made the cashew icing and I say that because organic cashews are expensive so I indulged (the icing reminds me of your raw cheesecake recipes, I have made the snickers one which was rich and wonderful). I thought the icing was good and my bf thought it was great. I think for the next time I will add some walnuts or pecans and perhaps a bit more cinnamon. great recipe! Just made them and they were really delicious.!! Moist and fluffy. The best vegan muffins I made till now. Just made this using tahini instead of olive oil and it turned out delicious! Also added a little but of ginger and nutmeg. Thank you for the recipe! Great! Thanks for sharing, Evelyn! made these and replaced the oil for a tbsp of almond butter, also used spelt flour instead of the blend. Turned out really great. I made this using normal wheat flour. The cake was very dense. I also finely grated the Apple and the carrot. Next time I would definitely use the large grater attachment and try to find a gluten free blend out replace more almond flour for flour. 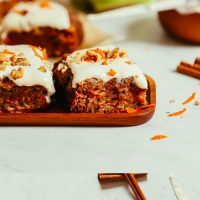 My bf HATES carrots but doesn’t mind carrot cake and he loved the flavor of this one! The cashew cream frosting was so good too- I may have eaten some with a spoon. The only thing is that the texture of mine came out dense and a little gooey. I followed recipe as is and used King Arthur gluten free all purpose flour. Any idea how I can make it more airy and fluffy? I’m not sure about the king arthur blend. That might’ve been the reason it wasn’t as fluffy? I have a couple of questions. Would coconut oil work in place of olive oil? I’m thinking of using white whole wheat and whole wheat pastry flour instead of the gluten free flour. Would that work? Thanks. That should work! Let us know if you give it a try. This recipe looks great for breaktime at work. Only thing may not be opened to substitutions as I used Yogurt instead of the milk and an egg instead of the banana. It came out a bit dry and I also see all the oatmeal flakes throughout the cake. Its still ok to eat but your looks soo juicy! I topped it with yogurt just so its not so dry. Hmm, I’ve not tried those substitutions and can speculate that’s where the texture went dry. Glad you still enjoyed the flavor! Great recipe, thank you! I added raisins, fresh grated ginger, and one egg plus the flax egg that is already part of the recipe. Frosting was excellent! We added a couple of soaked dates to that and got a very creamy and smooth result from the Vitamix. Will make this one again! Amazing recipe! I made this for lunch as our friend with lots of intolerances was visiting us. I made a few changes to adapt to the ingredients I had. I used self-raising gluten free flour, white sugar instead of brown, oat milk instead of almond milk and walnuts instead of cashews as he is allergic to the last ones. Everyone loved it even for being a gluten free cake! Only the frosting didn’t come up with the right texture because of he walnuts I imagine, but the flavour was good so we put it on top anyway to add a bit more mosture to the cake. Thanks for sharing, Nima! Next time would you mind adding a rating to your review? It’s super helpful to us and other readers. xoxo! I made this into muffins and they are THE BEST carrot/apple muffins I have ever made! Thank you for this delicious recipe! Thanks Stephanie! Next time would you mind adding a rating to your review? It’s super helpful to us and other readers. xoxo! I have an food intolerance to banana could you suggest a replacement for it I would love to try this. I would really like to make this healthy and obviously delicious cake for my baby girl’s 1st birthday:)) But I would like to replace walnuts with almonds. Should that work also? Yes, that should work nicely, Petra! I skipped the walnuts completely and it was still delicious – they are just added o at the end as decoration. I also switched oats for quinoa flakes, maple syrup for date syrup and used a mix of coconut and corn flour! Did you make the cake? Any way we can help troubleshoot? This is dreamy. I used spelt flour instead of the gf blend and coconut sugar instead of brown sugar and it turned out perfect. This is the first time I have tried making a frosting from cashews and it is delicious! I LOVE sweet recipes that aren’t sugar filled. I can’t stop eating this. not ground up to make flour? What is a prepared baking dish? Does that mean an oiled 9×9 metal pan ? Yes, either an oiled or parchment-lined 8×8 baking dish. This is fantastic recipe just as is. Thank you for sharing! Thanks for sharing! If you made it and loved it, would you mind leaving a rating next time? It’s super helpful for us and other readers. xo! Should I peel the apple before grating it? I don’t think it’s necessary. Not entirely necessary, but if you prefer a less textured cake, peel prior to grating! What is the equivalent of flax egg to a real egg? 1 flax egg = 1 small chicken egg. This cake looks really but I am wondering exactly what about this do you consider minimal. The cake has 15 ingredients and the topping six more. Not exactly minimal in my mind. Maybe you’re thinking about just one bowl? 10 minutes of work for delicious cake? I think that’s minimal! It’s a 1 bowl recipe. All of our recipes are either 1 bowl, 10 ingredients, or 30 minutes or less. When you read the recipe it seems like there’s loads to do but I made this last night and it really is just chuck it in a bowl and bake. I would say it is minimal as most of the ingredients, most people will already have yknow? Give it a try it’s really tasty! Hi Dana! I live in Buenos Aires, and I don’t have many of the ingredients listed here. The maple syrup for more sugar? The gluten free flour for normal flour? Hi Laura! You can replace the maple syrup with honey (if not vegan) or agave nectar. And you can replace the gluten free flour with spelt or unbleached all purpose. Can I omit the almond flour? What would I use instead? I want to make this for lunch boxes but school needs to be nut free. Why not be daring and just give it a try using whatever flour you have in your pantry. All purpose will not ruin it. I’d say replace the almond flour with a 1/2 and 1/2 blend of oats and GF blend. My little 21-month old daughter is allergic to all treenuts, pumpkin seeds and coconut. Do you have another frosting you could suggest? Thini instead of cashews? And what about the coconut to firm it up – whatelse can do that? I’m going to make this tonight. Thanks so much for the recipe. Gillian see the recommendations above! Hopefully one of those will help. Do you think its possible to skip the gluten free flour and just make it with almond and oat meal? Hmm, good question. I haven’t tested it that way. But if you try it, let us know how it goes! I would like to skip the flax eg and use flax seed meal, how many spoons do you think?? I’d recommend making the flax egg. It only takes a few minutes and helps bind the cake. Instead of flax egg, can I use an egg? Is that a silly question!? Not a silly question. 1 flax egg = 1 small chicken egg. You can give it a try! Let us know how it goes. 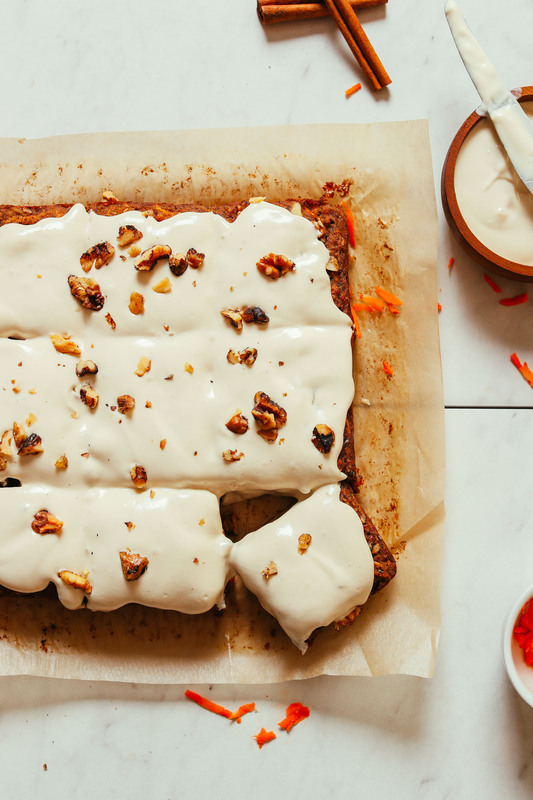 I made this carrot-apple snack cake. I was caught without apples and improvised. I switched it out for shredded coconut. It was a homerun. My husband gave it two thumbs up. If you don’t want to use flax eggs, how many eggs do you use? I have used rolled milet in recipes in the past, don’t know if you can get it in your local health shop, and I don’t know if it would work here. Thanks for the help Regina and Sara – those are great recommendations! yes, thank you, I can certainly find quinoa flakes here… I will go shopping tomorrow! And thanks Dana for the fantastic recipes – you have me constantly running to the kitchen to try new things – and this is from someone who could go a month or more without cooking before! Could I substitute almond meal with coconut flour or any other type of flour? We don’t have it in the city. You can make it! Grind up some almonds in the blender. Don’t overdo it or they turn into a nut butter…you want a course meal. Yes! I’d recommend grinding up raw almonds into meal – that should work! Oh must try this. Can I substitute the gluten free flour blend with coconut flour or all purpose flour? Hi, I will make this cake. My daughter is allergic to cashews, is there a substitute? 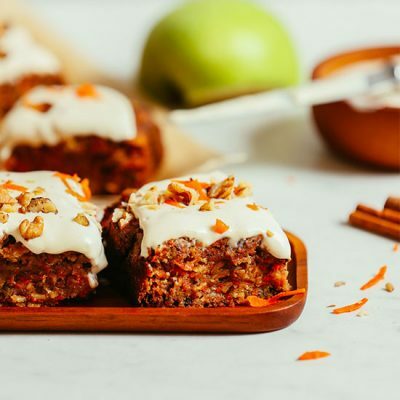 I made this cake but switched out the Almond flour and used Quinoa flour, a gala apple instead of green and added 1/4 cup unsweetened coconut to cake … no icing –Awesome! Gabriela – I would recommend subbing the GF blend with all purpose or spelt. Coconut will be too absorbent.